Wondering what to get your mom this Mother’s Day? It’s a special occasion – certainly deserving of a thoughtful surprise. Tug on the heartstrings of the superwoman in your life with Q-Photo’s gift ideas for mom. A sure-fire way to inspire smiles and a few tears from Mom is with a beautiful personalised photo book. Fill each page with great memories – following a specific theme if you’d like – and add sentimental captions that she’ll appreciate. Dig through the memory box and create a book that documents her story. Scan and upload classic photos from Mom’s childhood, teenage years and perhaps of her and Dad before you came along. It’ll be something sentimental for both of them! A book filled with adventures, milestones and fun filled days that you (and your siblings) have shared with your mom. Showcase the ways she inspires you – whether it’s her selfless love or the pursuit of her passions. Make her laugh by recreating old photos. Find old family pictures and rehash the same pose with similar clothing. 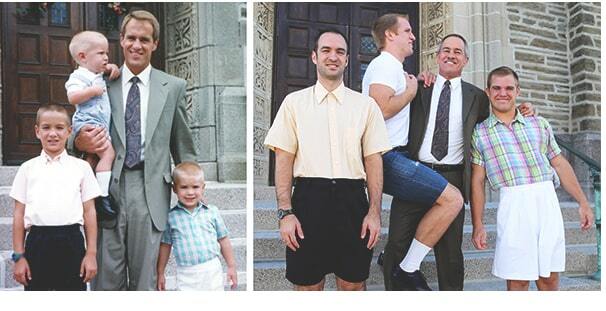 This before and after photo trend always gets a good laugh. Early in the morning, throughout the day, or in the middle of the night; your mother was always there for you. Imagine all the sleepless nights! A good cup of coffee was no doubt her salvation. Say thank you for those late nights and early mornings with a personalised ceramic photo mug. What does Mom like? Does she have a preferred flower, a favourite place, a pet that follows her everywhere? How about a picture of you and your siblings that she absolutely adores? Whatever it is that makes her smile, turn it into a Mother’s Day gift that will keep her warm, both literally and metaphorically. Plan a special day by inviting the women in your family for a nice brunch or picnic at the botanical gardens. It’s a simple yet lovely way to spend the occasion with other great moms. It’ll be a sweet experience for your mom, and all the other ladies that play a role in her life. Remember to take photos! Pick your favourite shot and create a beautiful canvas print to present with your gifs for mom on Mother’s Day. This souvenir will be the cherry on top to commemorate the happy occasion. Tip: Use a digital camera to produce high-quality photos, which works best for canvas prints.